The Workplace Depot stocks a wide range of equipment and accessories to keep your industrial and commercial premises safe and while helping employees become more productive and efficient. 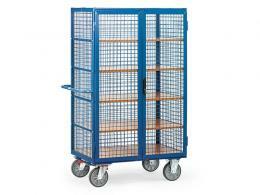 When it comes to cage mesh cart trucks, our products will help you manoeuvre those bulky, obscure objects around your workplace, be it inside out outside. Our range of products is ideal for industrial workplaces such as supermarkets, factories, warehouses and large storerooms. In particular, some of the trucks are perfect mobile storage solutions when you need to get stock from one place to the next, or leave them standing for a little while. Trucks can be stored underneath your racking in order to create an integrated storage unit. 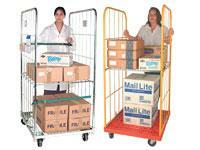 Most our carts come with 2 adjustable shelves and can withstand as much as 500kg per unit. Our wire cage carts are the ideal solution for moving around heavy loads without being able to see what’s in the solid cart. 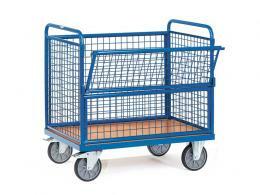 There are corner mounted wheels which make this cart the best choice for keeping heavier loads stable. You can choose from several different body styles should you require a light duty mesh cart that can withstand 150kg, or even a much heavier alternative that can handle loads of up to 500kg. Our cart trucks come with steel welded frames that are extremely safe and durable for your employees to move around the workplace. 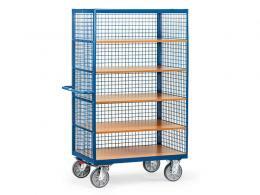 If you’re looking for a more robust option, try the heavy duty box cart that can hold loads of up to 750kg. 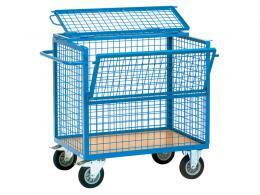 This cart can be supplied with either a padlock rod system door or even an open front. There are also 4 adjustable wooden material shelves. Browse our range of trucks today and then place your order for free delivery within 10 – 15 working days. The Workplace Depot accepts most major credit card as well as PayPal payments. Our goods come standard with a one-year warranty on parts and labour.